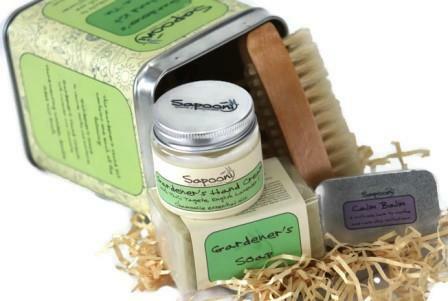 View basket “Flower Power Soap Trio” has been added to your basket. 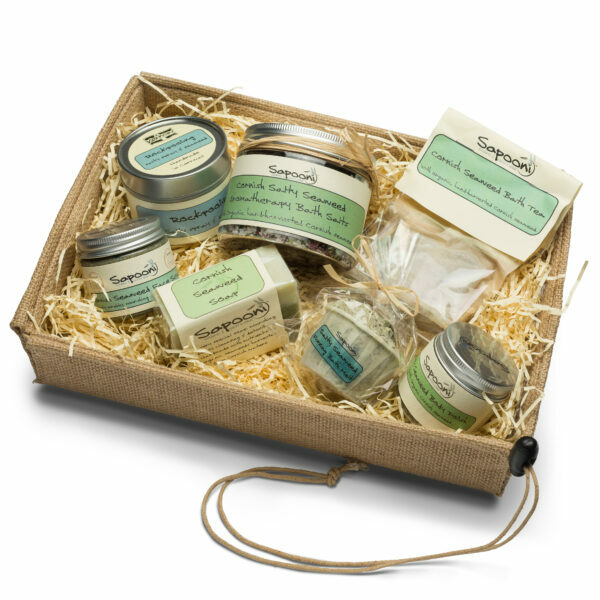 Spa – style pampering for a very special person… The complete works, in our Ultimate Cornish Seaweed Spa Hamper; our whole range of Cornish Seaweed soap and skincare, including three Award-Winning products; Cornish Seaweed Soap, Cornish Seaweed Face Scrub, and Cornish Seaweed Bath Salts. 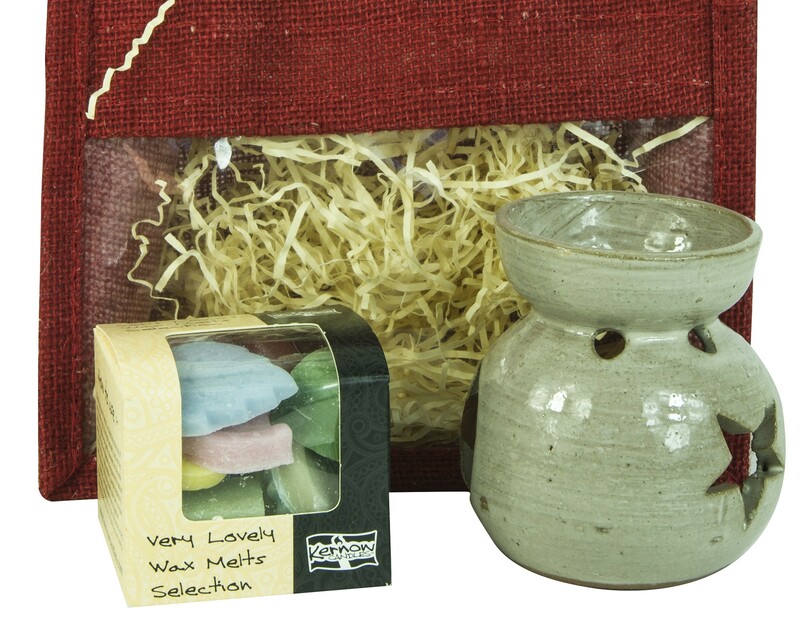 Presented in a pretty wicker basket, and finished with a co-ordinating hand-tied ribbon and gift tag. 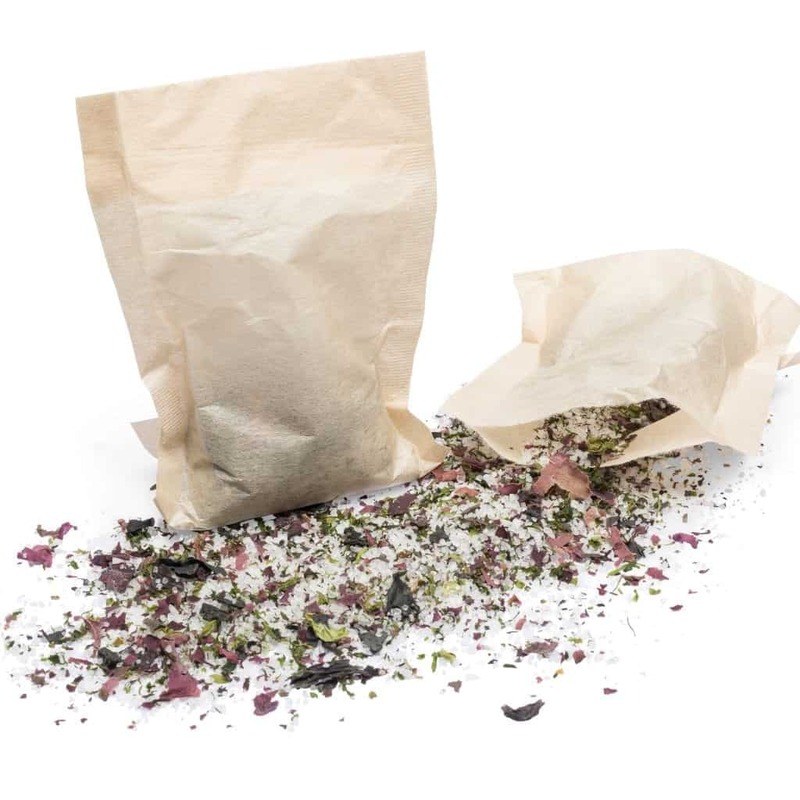 When we formulate our range of Cornish Seaweed products, the star ingredients are a carefully chosen blend of organic wild Cornish seaweeds, harvested by hand from the clear, clean waters around the Cornish coastline. A gorgeous pamper hamper for anyone who deserves some pampering and “me time”. We can include a gift message with your order; simply let us know at Checkout. 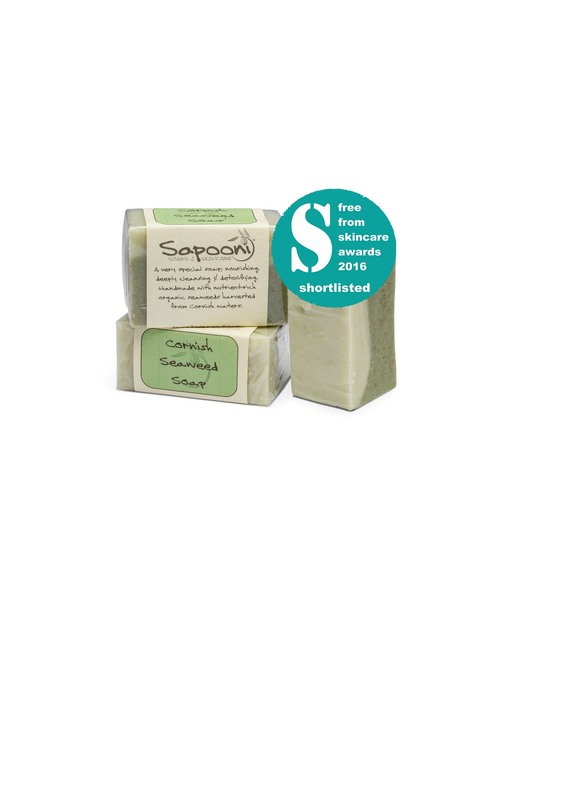 Cornish Seaweed Soap; The star ingredient is Cornish seaweed, which is packed with skin-loving minerals and vitamins. We gently infuse the seaweeds in water to release all those lovely ingredients, then add both the infusion and the chopped leaves to capture all their goodness. 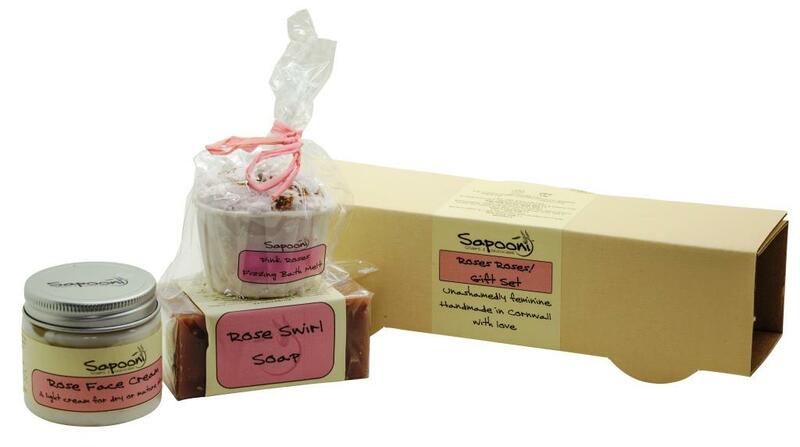 The finished soap is gentle,moisturising and has a rich creamy lather and a fresh, invigorating scent. Cornish Salty Seaweed Aromatherapy Bath Salts; For those who know their seaweeds, we use a combination of Bladderwrack, Kombu, Dulce, Nori and Sea Lettuce in our seaweed range. 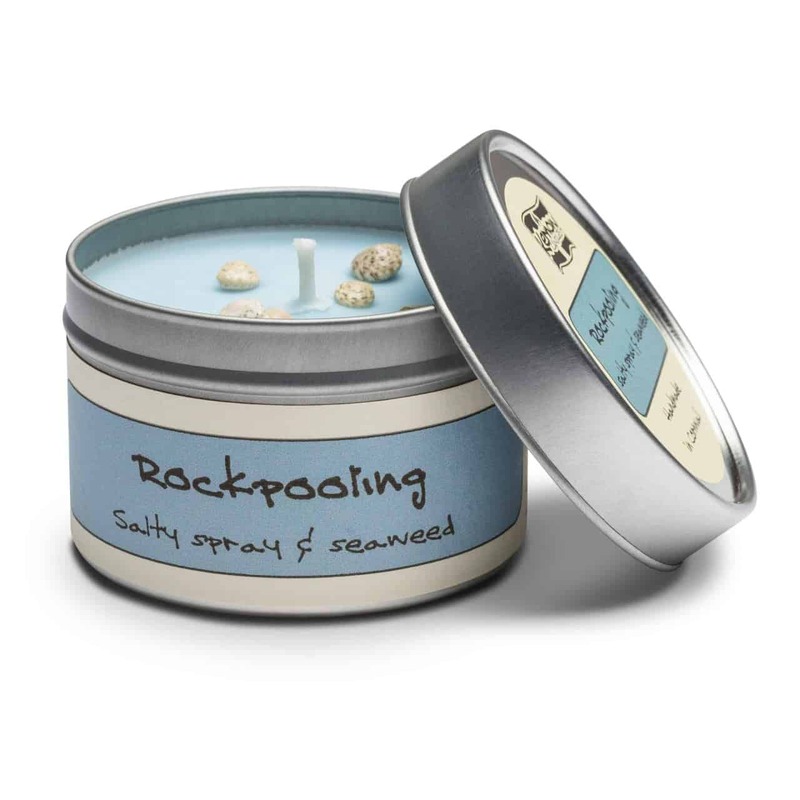 Here we’ve combined them with sea salts, epsom salts and invigorating essential oils. Award-Winning; “Bathing Product of the Year”. 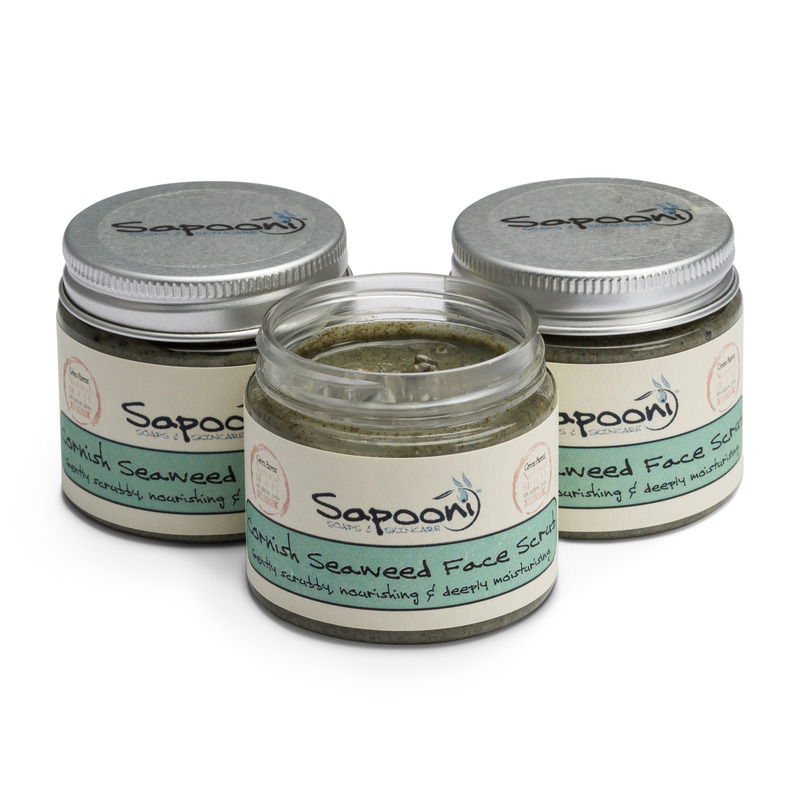 Cornish Seaweed Face Scrub; A blend of clays, oils, seaweeds and natural exfoliants go into making this award-winning face scrub. It’s gentle, natural and effective. Salty Seaweed Body Polish; Slightly scrubbier than our face scrub, with a blend of salts, oils and butters combined with the Cornish seaweeds, to nourish and moisturise the skin, and gently slough away dead skin cells. Cornish Seaweed Bath Tea; For those who don’t like bits in their bath; a blend of natural ingredients, packed into a giant bio-degradable teabag, for a water-softening, therapeutic addition to a long lazy bath. 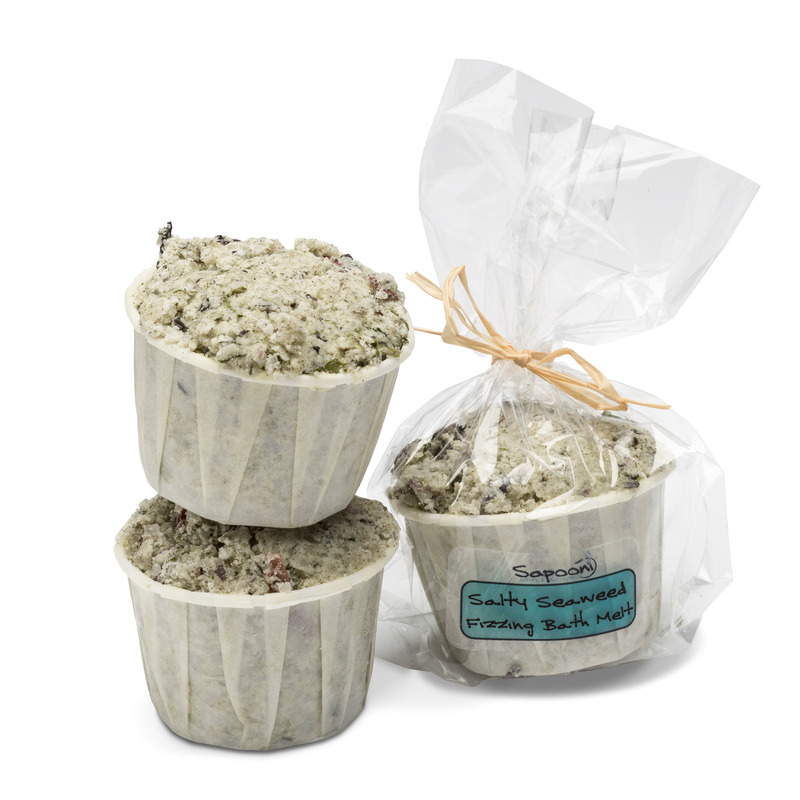 Salty Seaweed Fizzing Bath Melt; A bath bomb with attitude, formulated with our lovely seaweeds, sea salt, and moisturising butters. 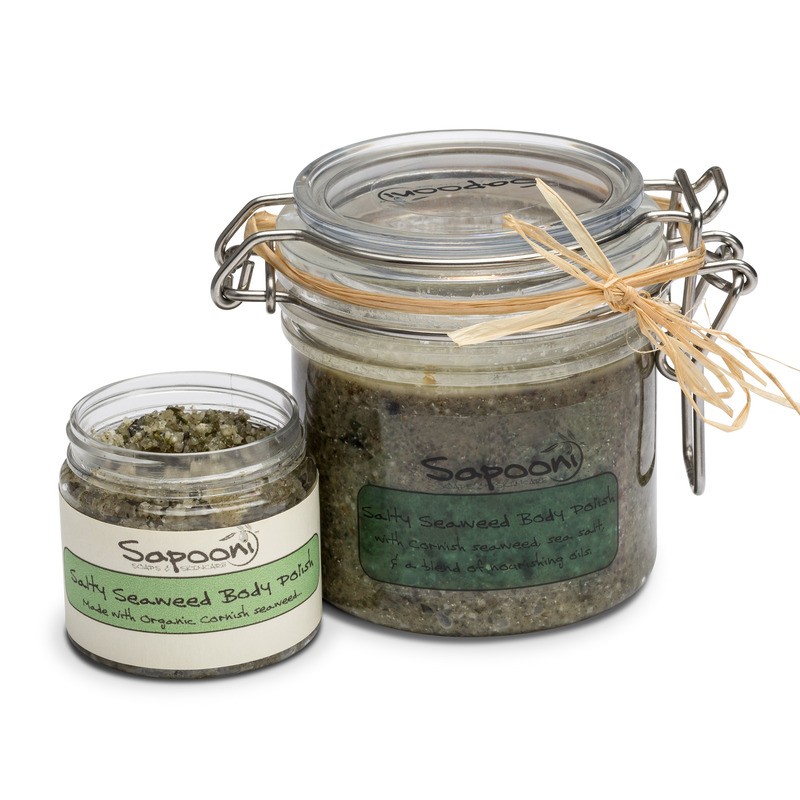 Pop the whole pot into a hot bath for a skin-softening, luxuriant soak. Burn time; minimum 20 hours. 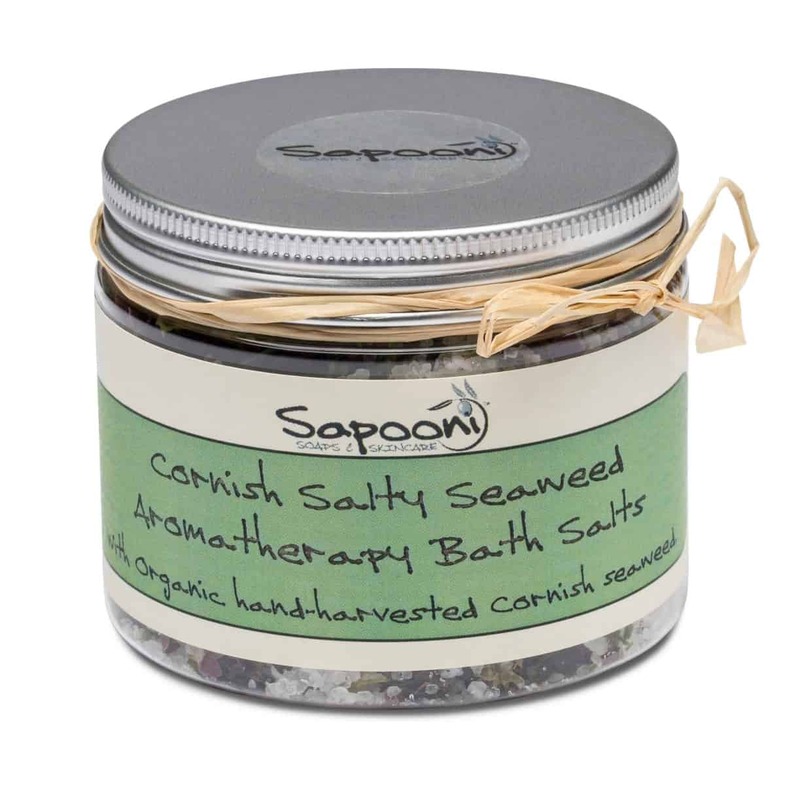 See individual product listings for full ingredients of the products in our Cornish Seaweed Pamper Hamper.